How does the ice melt when you put down de-icing materials? 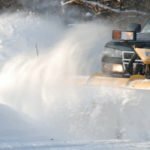 I often get this question from my customers and its best to understand the different de-icing products on the market, how/why they work, and why price fluctuates between them. Before we dive into costs it is very important to understand how ice melt works first. Upon researching this topic I found that ice melt actually disrupts the chemical properties of water (H20) from freezing which creates a confusion to the process of water freezing. (This effect is called freezing-point depression.) In a nutshell Salt lowers the freezing temps of water. Interesting fact for sure. Its all about price, availability of the natural resource, and their effectiveness. 1. Sodium Chloride (NaCl): Also called rock salt this is one of the most abundant chemical compounds found on the earth. It is harvested by a variety of methods from mining both by open mines and underground mines; it is evaporated from brines that are flooded into pans from natural sources on the surface such as the sea; and, it is solution mined where we pump it from underground salt domes as a concentrated brine. As a deicer, sodium chloride is number one by a landslide because it is cheap, readily available, and found the whole world over. It will melt snow and ice effectively at temperatures down to +16 degrees, but performs best in the mid-20s. Sodium chloride contains 67% chlorides and about 30% sodium so consider that these two ingredients will end up causing 90% of the benefit and 100% of the problems. 2. Magnesium Chloride (MgCl2): A premium or high performance deicer because of its effectiveness, it is a naturally occurring chloride compound like sodium chloride,. Magnesium chloride is found throughout the world in surface and underground mineral reserves. Magnesium chloride is more expensive than sodium chloride but less than calcium and potassium chlorides. In the US, the Great Salt Lake is a major source of magnesium chloride along with similar places in the world like the Dead Sea. It is also solution mined from vast reserves under Northern Europe, China, and in the US as well (pun intended). In the commercial deicer form as a dry hexahydrate, magnesium chloride contains 34% chlorides and 18% Magnesium. It’s gentle on most surfaces and vegetation as well as pet safe and has gained wide popularity in the last few decades because it doesn’t track and its low environmental impact. 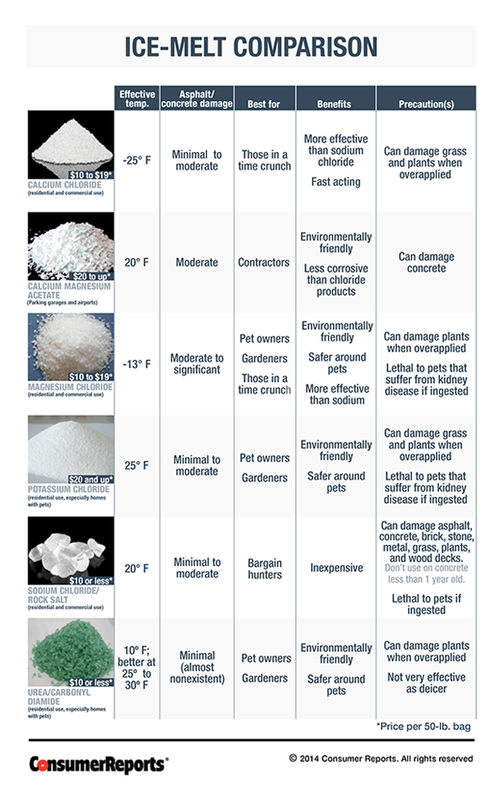 It’s very low toxicity is comparable to Vitamin C. Found in pellet, flake, and liquid solutions from 25-35%, magnesium chloride has exploded in use and demand in the world over the past two decades because of it balances high performance with low environmental impact. It will melt snow and ice effectively down to -13F. 3. Calcium Chloride (CaCl2): Another naturally occurring chloride like sodium and magnesium, calcium chloride is predominately found only in underground brines where it is brought the to the surface, refined and dried. Calcium chloride is more expensive than both sodium and magnesium chlorides. Calcium chloride is far and away the most recognized premium deicer because it has been widely used in the US for over 100 years. Tried and true this powerful premium deicer comes in pellet, flake, and liquid forms. 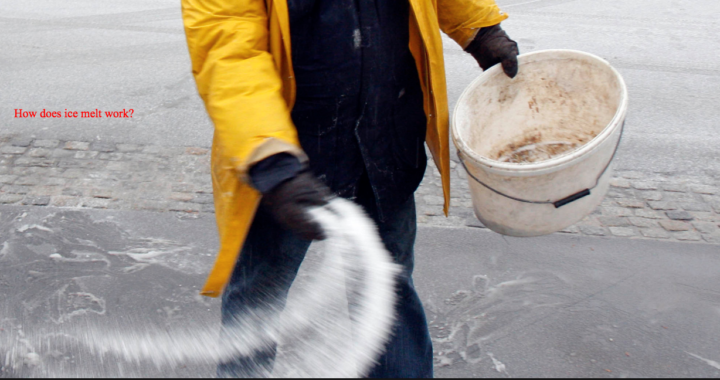 Like salt, calcium can be messy when it is tracked in and its toxicity is the highest of all chloride based deicers. Long established and far and away the lowest temperature deicer, it will melt ice to -25F. It tends to be a little harder on surfaces but it does a great job, Most premium deicers compare their performance to calcium chloride because it is so well recognized. 4. Potassium Chloride (KCl): A naturally occurring chloride like the others mentioned above, potassium chloride is actually used very little as a deicer at this time. It is the principle ingredient in fertilizers as a source of potassium. If you buy potassium chloride at a fertilizer dealer or farm supply, you would order it by it’s fertilizer designation of macro-nutrients: 0-0-60 (Nitrogen-Phosphorus-Potassium). It is 60% potassium and only 37% chlorides so while it’s very easy on the environment it is also fairly ineffective as a deicer because it doesn’t melt below +25F. People tend to like it because of the fact that its so environmentally friendly but in recent years the cost of fertilizers coupled with insanely rising prices in fertilizers have driven potassium chloride quickly from the #2 spot to the #4 spot on the ascending cost scale. It has risen in price more than 10 fold from $80 in just the last three years so this year (2008/2009) we are seeing virtually no potassium chloride in deicers other than background levels which occur naturally. At over $1000/ton in bulk currently potassium chloride has exited the market as a deicer in most places and has been replaced by magnesium chloride which is it’s first cousin. 4. Acetates: Commonly found in three forms; sodium acetate, calcium magnesium acetate, and potassium acetate, acetate deciers are not chloride based and take an entirely different approach to the task of deicing and the market. They protect surfaces and structures from chloride damage because they don’t contain any chlorides. They are organic chemical compounds that break down naturally in the environment and leave little adverse impact. Those benefits come at a steep price because the main ingredients used to make acetate deicers (acetic acid, dolomitic limes, and potassium chloride) are very expensive and in short supply in the US at this time driving prices up. Available in dry and liquid forms, acetates are commonly used in structural concrete, parking garages, and airports where chlorides are banned due to the corrosion potential to aircraft systems. 5. Others: Other deicer options cover a lot of products but represent a very small segment of the market: Urea, ammonium sulfate, glycols, and formates are the most common ones but again these are in pretty small numbers because of their costs or performance relative to the “big five”. Final notes and thoughts… When you call us to apply salt on your driveway by default we will always use Rock Salt – Halite However we do have the ability to apply any of these products. Please note that the cost typically double from Rock Salt to any of the other products but you can see the value to using them. Salt and chemical de-icers are not only painful for your dog to walk on, but can also be dangerous if consumed. mean BrookBerry's Blog: Ice Melt FAQ is a little vanilla. how they write article titles to get viewers interested. You might add a related video or a picture or two to get people interested about what you’ve written.